Arsenal and Napoli give the start on Thursday, April 11, for the duel for the quarterfinals of the 2018/2019 version of the Europa League. The meeting will be held at the Emirates Stadium in London. The kick-off was scheduled for 16h (Brasília time). The draw for the definition of the quarterfinals also established the way to the decision. Whoever surpasses this stage will find in the next phase the winner of the confrontation involving Valencia and Villarreal.The definition of the winner is made in the same way as in the previous matches. Whoever scores the most points after the two starts survives in the title fight. In case of equality, the goal balance is the first tiebreaker. If necessary, the number of hits logged in as a visitor can also be used to determine who wins. If even that does not resolve the situation, a 30-minute extension will be held after the second game where the goal away from home also carries greater weight. If the extra time is 0-0, the setting will be made through penalty kicks. The Gunners did not have a good result in the last match before the duel with the Neapolitans. On Sunday, April 7, they faced Everton in Liverpool, meeting the table of the thirty-third round of English Premier League 2018/2019 and were beaten by 1 to 0.They had, in this way, interrupted a sequence of three victories. 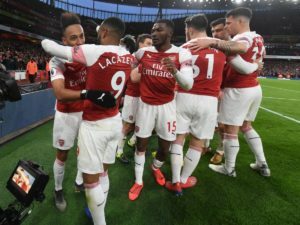 Staying in the 63 points (19 wins, six draws and seven losses) fell to fifth place on the Premier League standings starting from the 2019/2020 qualifying zone of the Champions League, which includes the top four.Worst of all was the lack of reactive power shown by Arsenal, who conceded the goal in the ten minutes of the first half and even counting with 57% possession of the ball only tried seven finalizations throughout the match hitting only two shots in the right direction .A very different team from Arsenal that usually imposes itself when it acts in the Emirates Stadium. As principal, the team presents the third best performance of the Premier League. Of the 51 points he played at Emirates Stadium, he won 44 (14 wins, two draws and a loss) having scored 39 goals and suffered 12.The medical doubts for Thursday’s meeting are held by defenders Hector Bellerin, Rob Holding and Laurent Koscielny; the midfielder Granit Xhaka; and striker Danny Welbeck. The last impression left by Napoli before their debut match in the Europa League quarter-finals was also not the best. On Sunday, April 7, for the thirty-first round of the Italian Championship, it was no more than a 1-0 draw against Genoa at the San Paoli stadium in Naples.The tie against a side that is in the fight against relegation, which would be considered bad under any circumstances, still had as aggravating the fact that Genoa have played with ten athletes since the 28 minutes of the first half when Sturaro was sent off.It was the second consecutive defeat of the Neapolitans for a team that is in the fight against the sticking. On the previous day, the team had lost, away from home, 2-1 to Empoli. The results had no effect on the positioning of the team in the standings. With 64 points (19 wins, seven draws and five losses), he is in second place.What increased was the difference for Juventus, leader. It has reached 20 points, which should only anticipate the eighth consecutive title of the Series A by the Old Lady. The front of Napoli in relation to Internazionale, third placed, is seven points.The only good news of the confrontation was the return of midfielder Lorenzo Insigne. After four away games for injury, he has played for 24 minutes and will be available for Thursday’s meeting. Next in the medical department the defender Raul Albiol and the midfielder Amadou Diawara. 1. Latest info before playing betting tips Arsenal vs Napoli. It occupies 5th place in the Premier League, it has 63 points, one less than Tottenham and 3 under Chelsea. He eliminated from the Europa League BATE Borisov (3-1) and Rennes (4-3). The weekend suffered the first failure after three consecutive wins, 0-1 on Everton’s field. He has 7 wins in a row on his own field, when he only received 2 goals. Koscielny and Xhaka have physical problems and it is unclear whether they will be available for this match. Holding, Wellbeck and Bellerin are injured. She is second in Serie A, with 64 points, 7 over Inter and 20 under Juventus. He went to the Europa League of Zurich (5-1) and Salzburg (4-3). He scored only 2 points in the last 2 stages of the championship, after 1-2 at Empoli and 1-1 with Genoa. Only one victory have Napoletans in the previous 4 games. Raúl Albiol and Diawara are injured and miss the trip to London. Ospina, the former goalkeeper of the guns, is summoned, but he is uncertain because of medical problems. 2. Arsenal vs Napoli teams probable! Arsenal (3-4-3): Cech – Mustafi, Sokratis, Monreal – Maitland-Niles, Torreira, Xhaka, Kolasinac – Iwobi, Ramsey – Aubameyang. Napoli (4-4-2): Meret – Rui, Koulibaly, Maksimovic, Malcuit – Zielinski, Ruiz, Allan, Callejon – Insigne, Milik. 3. Information about direct Arsenal vs Napoli meetings. They met in a Champions League group six years ago. Each team then won the home game with 2-0. Of all the holders of those matches, only 3 are in the current Arsenal team, namely Napoli. The two teams have a very similar way of acting. They try to have possession of the ball as long as possible, they exchange passes with patience waiting for the best opportunity of penetration. The home factor indicates the hint at Arsenal’s success as the best option for the Europa League quarter-final leg of the 2018/2019 Europa League. On the ground, the tuners have a very good balance. I do not think Naples can defeat Emirates, especially the modest form in which he is. Being just the tour, I expect some caution from both teams and I do not anticipate a game of abundant goals. More than 5 successes would be really hard to see. Napoli drew PSG and Red Star Belgrade on Champions League away, lost to Salzburg and Zurich only managed to win over the country. All games had at most 4 goals on the table. Arsenal has not lost any matches in the Europa League on his own, all ending with up to 4, except for the Vorskla match, a more vulnerable defensive than Ancelotti’s.